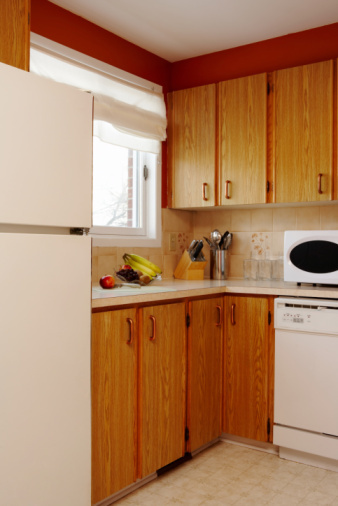 Many homes are arranged to accommodate a microwave over the range, and this can be an excellent set-up. However, you may wish to relocate your microwave to a countertop for a number of reasons, including easier access or a kitchen remodel. Fortunately, making the switch is a very straightforward process requiring only basic tools and an assistant. Before you attempt to remove an over-the-range microwave from its mount, measure its length, width and height. Identify the location you will place it on your counter and verify that it will fit comfortably in that space. Consider things like necessary clearance for the microwave door, extra space above the microwave for ventilation and adjacent outlets. Keeping appliances away from areas with frequent water spillage, such as sinks, is also a good idea. To safely remove your microwave, first shut off the power to the circuit into which it is connected. Once you have done so, unplug the appliance. It's ideal to remove an over-the-range microwave with the help of another person for the sake of safety. Ask your helper to stand next to the range while you use a stepladder to reach the height of the top of the microwave. While standing on a stepladder, identify how the microwave is mounted. Many appliances use a mounting system that is bolted directly to the wall or hung from the cabinets above. To remove the microwave, you will need to remove these bolts. Then, you can detach the microwave from its mounting system. Ask your assistant to support the microwave firmly from below while you remove these connections. Once you have successfully removed the microwave, you and your helper should carefully lift it to countertop level and set it down in the desired location. If you wish to remove the mounting brackets where the microwave was attached, you may do so now. Now that the microwave has been removed from the wall, test it in the location you envisioned it would sit on your countertop. Be sure that there is extra space above and on all sides of the appliance for air circulation. Open and close the microwave door to ensure it will not hit any walls or other kitchen fixtures. Plug in the microwave and be sure the cord can comfortably reach an outlet. If you have a lot of extra power cord, you may wish to fold it on itself and use zip ties to create a shorter cord. Be sure you don't overload any outlets or circuits, and avoid plugging a microwave into an extension cord or power strip. Microwave ovens can be bulky, so consider a corner space or beneath a hanging cabinet for an aesthetically pleasing look. Keeping your microwave near the refrigerator (if you often heat up leftovers) or near your table (if you often read the newspaper and let your coffee get cold) can add convenience. Turning your microwave at an angle can work in certain spaces, and it can also help with the feng shui of your kitchen. What Is the Proper Distance to Separate a Microwave & a Range Top?